As I mentioned the other day, last weekend we helped out Miss Linda in her garden. 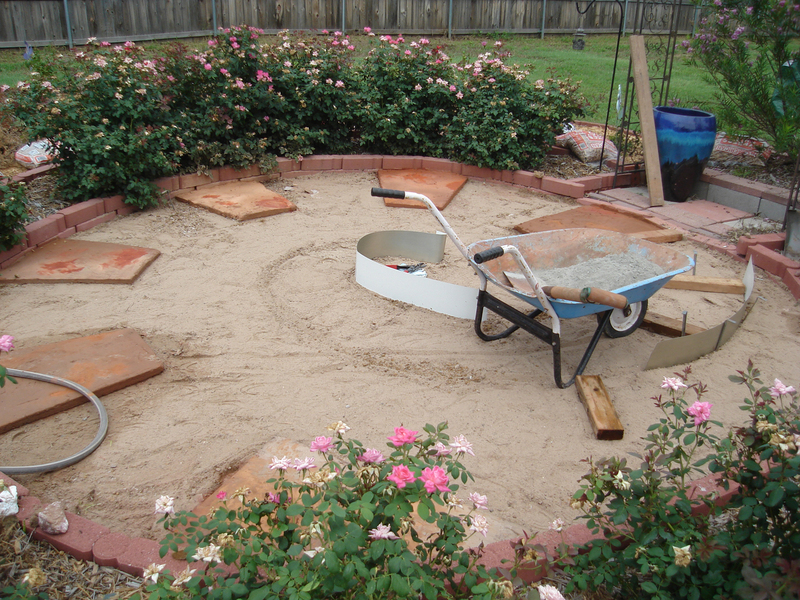 While I worked on making stepping-stones, my husband worked on an even more ambitious project. Miss Linda is an avid gardener and had a beautiful garden, one which I used to call the “Secret Garden” because it was just overflowing with roses and vines and little pathways, it felt like you were in your own secret place, an enchanted place. This wonderful garden took years to grow, and my hubby recalls that while growing up, Miss Linda spent a lot of time tending to her garden. Unfortunately, a tornado in 2011, came through the neighborhood, and though it spared the house, it wiped out the garden. Everything from rose bushes to the massive mulberry tree was ripped out or cut apart. Since that time Miss Linda has been working hard to rebuild her garden, planting new flower beds and trees. Because the tornado took out a lot of garden overgrowth, there is a lot more ground space in the yard, and instead of filling every inch with garden, Miss Linda decided to create some patio / seating space. 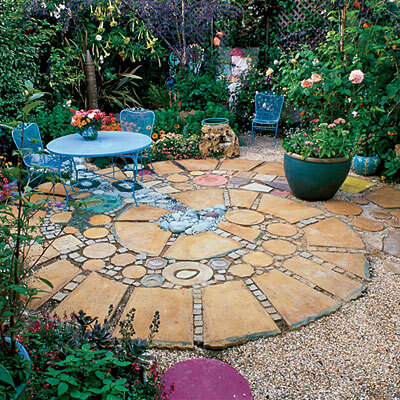 In one such location she wanted to to have a circular patio made of mix of stone pavers and stepping-stones, much like one she found in an image online. 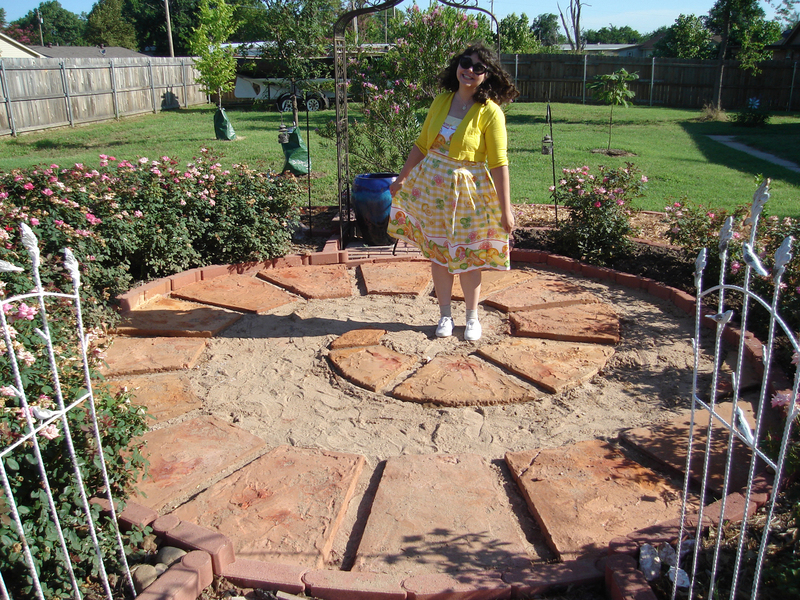 Miss Linda already had some raised flower beds built around the location in which she wished to create this circular patio. Following the inspiration photo she wanted to use a slate type stone for the large pieces, and then have varied sizes of stepping-stones, all with blue tones. The blue tones she hoped would give a cool water like look to the area. 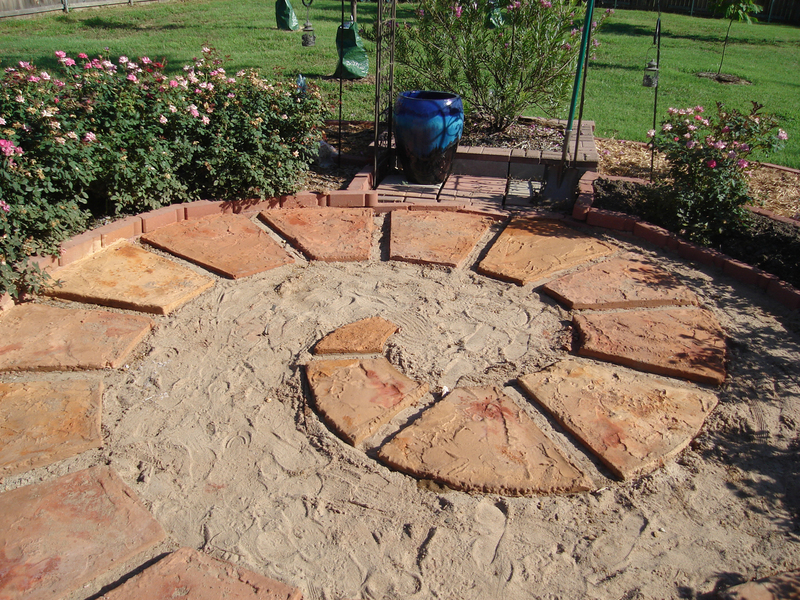 She began this project by buying some circular concrete stepping-stones and spray painted them blue. Then there were the smaller stepping-stones she and I would make. The only thing left was the larger slabs of stone as shown in the inspiration image. Miss Linda didn’t exactly know how she was going to achieve this look, since the stones she had seen at the lawn and hardware stores, wasn’t exactly what she wanted and she wanted them to fit in the space perfectly. Then my hubby came to the rescue, by suggesting he just make the custom stones, from some forms made of two by fours and some quick-setting concrete, which he would stain to the color she wanted. So, while we worked in the shade on stepping-stones my hubby got to work on the patio’s larger stones. 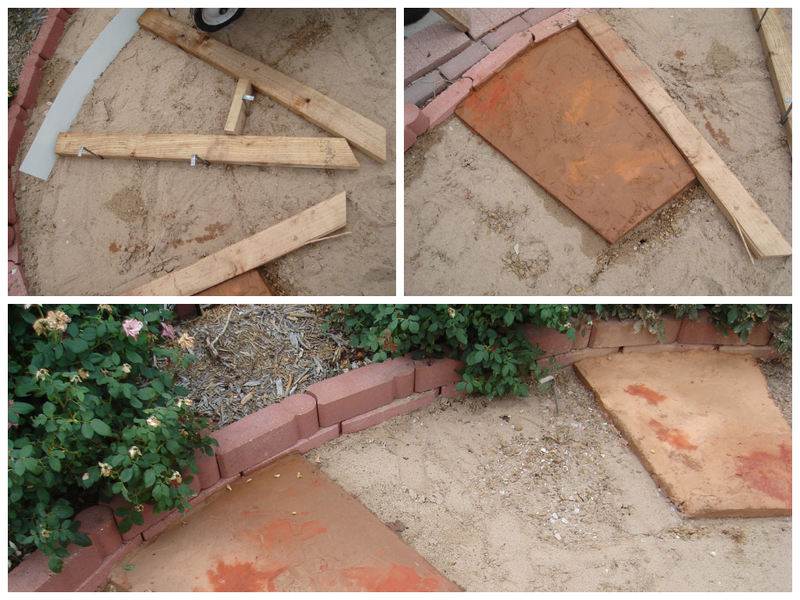 He started by first leveling out the patio area, which sand had already been placed in. Then in the sand he drew out a pattern to follow when creating the stones. To get started he used a quick set concrete by Quickrete and a mix of both their tarra cotta and buff concrete stain colors. 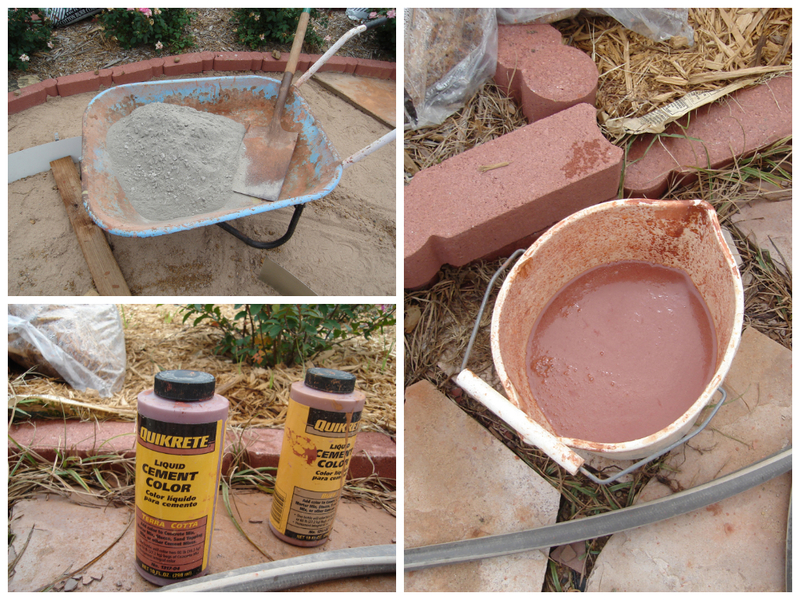 After getting the concrete mix just right he would mix the colors in a separate bucket and add it to the mix. To create the stone form, he used a couple of 2 x 4 boards that had been left over from a different project. He would place the form then fill them up with the concrete mix. It took about one bag of concrete mix to fill up one form for the large forms. After getting the concrete in the form he would wait a few minutes, during which time he’d wash out the wheel barrel so the left over concrete wouldn’t set. Then after cleaning up he’d splash on a bit more of the color mixture on top of the concrete to give it a random more natural color. Before the concrete had completely set he’d remove the form and began work on the next one. He made sure to work on every other stone, since he didn’t accidentally want to mess up the previous one, by moving the wooden forms too much. Fourteen hours after he started, and about 18 bags of concrete latter, he was finally finished. The forms set really fast, since we used the quick-setting kind and because it was 90 plus degrees outside. The next morning he took some pictures of his handy work. 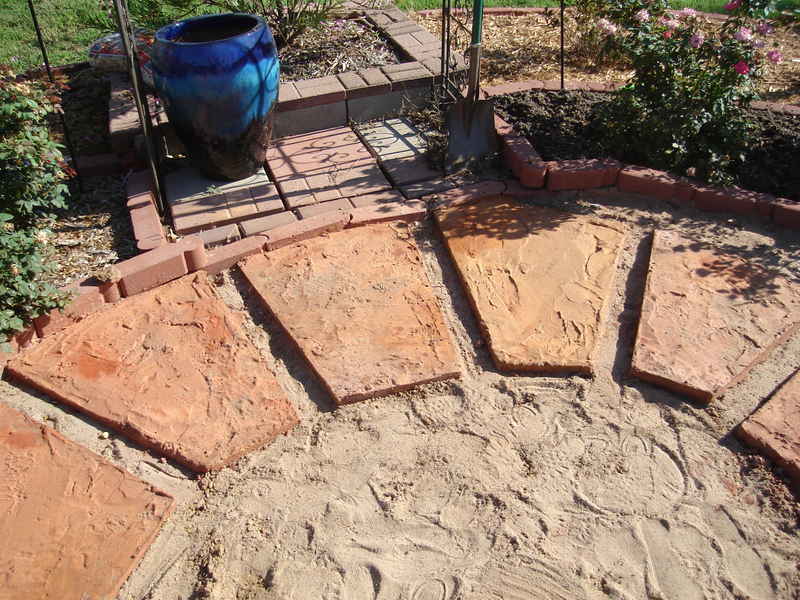 All that’s left is for the stepping-stones of varied sizes to be placed in the empty areas. Though not completely done yet, that didn’t stop me from having my picture taken in the patio. In case you’re wondering yes, that is my lemon dress I made a while back. Complete with a yellow sweater I purchased at the local Ross store. All in all I think the patio looks great and so did Miss Linda. My hubby worked really hard, so I can’t wait to see how the rest of the patio turns out. Will have to get the completed photos from Miss Linda when it’s done.